How Damaging are Hardwood Flooring Beetles? Hardwood flooring beetles, can turn a plank to powder. How damaging is this wood eating critter? Several times each year, nationally recognized and certified flooring inspectors The Weinheimer Group, receives calls regarding powderpost beetles. The home or building owner or flooring company has found or been made aware of small holes in a hardwood floor. The caller believes beetles are destroying their hardwood floor and their house. Often, they have called a pest control company and the overzealous sales representative has frightened them even more, telling them they have powderpost beetles in their hardwood floor and possibly in the house. Powderpost beetles are the most common hardwood flooring beetle. This beetle can be confusing for homeowner, those in the flooring business and even pest control companies. 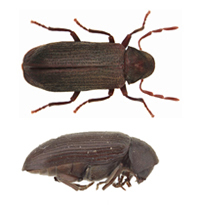 In this article, we discuss three wood destroying hardwood flooring beetles, the Lyctid (Lyctidae), Bostrichid (Bostrichidae) and Anobiid (Anobiidae). The Lyctidae is the beetle we have most commonly found while investigating hardwood flooring beetle concerns in Oregon and Washington. This beetle attacks products made of hardwood such as oak, ash, walnut, hickory, poplar and cherry and also bamboo. 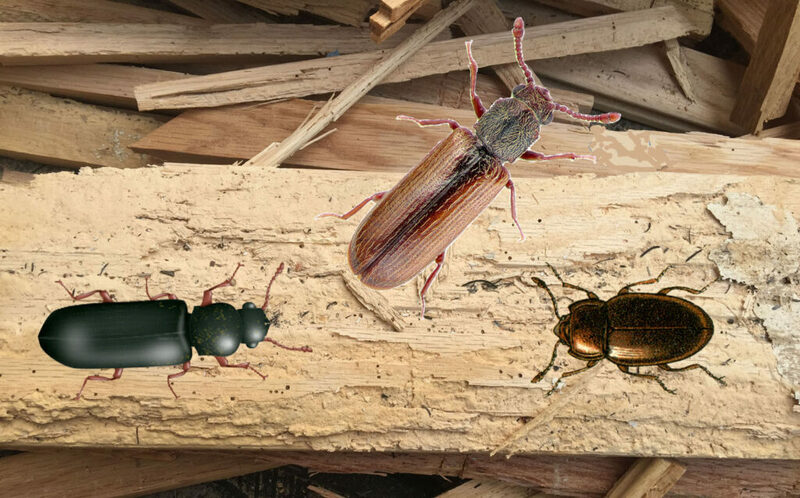 Lyctid beetles are rarely found in the structural lumber of a house or other wood structure. This beetle is a hardwood eater and avoids soft wood. Residential lumber is usually milled from softwood trees such as spruce, fir and pine, particularly douglas fir in the pacific northwest. This Lyctid powderpost beetle is small (1/16-1/4 inch), narrow and elongated, reddish-brown to black in color. When the adult bores out of the wood they leave a small emergence hole (shot hole) about the size of a pinhead. They also leave a powdery substance (frass) around the hole that feels much like talcum powder. Lyctid wood eating beetles that have bored into flooring may have come from furniture, cabinets. hardwood molding. More often, eggs were laid in the hardwood flooring before installation, where they developed into a grub larvae. After hatching, the grub tunneled through the wood as it fed, and one to five years later it emerged as an adult. The Bostrichidae powderpost beetle varies in size from about 1/8″ to 1/4″. Compared to lyctids, bostrichids have narrow-flattened-bodies, and the head is oriented downward, giving a “hooded” appearance. The bostrichid, creates a larger hole than a lyctid and the powder-like frass is more meal-like than that of the lyctid. The bostrichid develops rapidly and damage is often seen within the first year. Bostrichid powderpost beetles prefer hardwoods though they will attack softwoods. Like lyctids, they usually attack newly processed hardwoods with high starch and moisture content. The home’s framing is usually at little risk since these beetles seek high starch content. Tropical hardwoods and bamboo are more commonly prone to attack by bostrichidae. Tropical hardwoods are particularly vulnerable during importation. The Anobiidae beetles range in size from 1/32″ to 3/8″ long; however, those that attack structures are 1/8″ to 1/4-inch long. Unlike the lyctid, the frass has a gritty feel. The Anobiid will attack both hardwoods and softwoods. Therefore, they will attack the structural components of a building. The anobiidae prefers a much higher moisture content as they require 13-30% moisture for the larvae to develop. The Anobiid will usually be found in areas such as crawlspaces, basements, garages and other damp and unheated temperature controlled areas. These Hardwood flooring beetles are most commonly found in locales where the humidity is humid, temperature high and crawlspaces common. 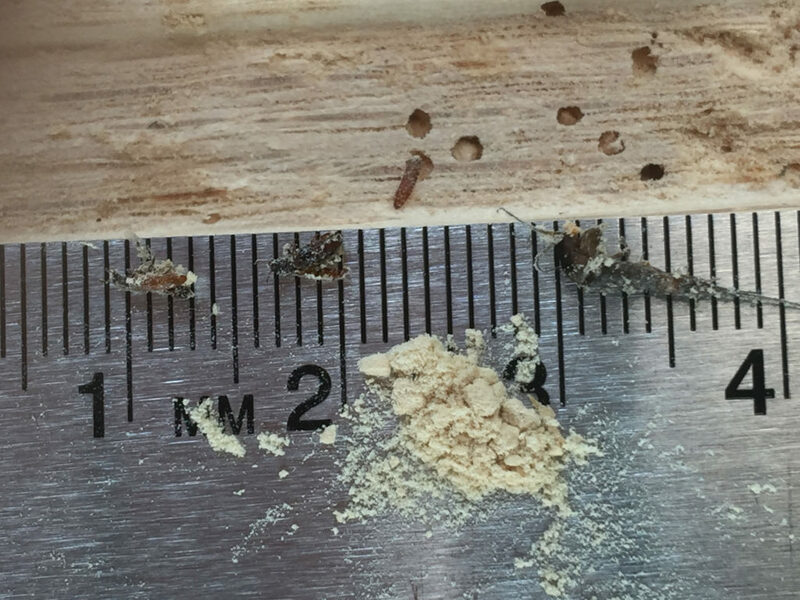 Unlike the lyctids and bostrichids, this powder post beetle can digest the cellulose within wood which enables them to attack wood regardless of age. The larvae develop slowly and thus its infestation is rarely seen in building of less than 10 years in age. When the services of The Weinheimer Group are engaged to investigate, claim regarding hardwood flooring beetles, we may find there is little need for immediate alarm. We perform a full investigation to determine if there is an active infestation. The property owner has seen holes which may or may not be abandoned. The holes may have been there prior to installation and just noticed. 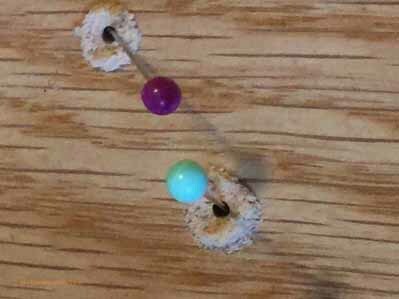 Some grades of flooring allow open beetle and worm holes. Holes allowed within a grade are not active and are part of the appearance of that floor. During all flooring inspections, we perform multiple tests to determine if there is an active concern. If there is, we identify the type of wood flooring beetle and the extent of the active infestation. We gather samples, and document our findings. Following the site visit we review our findings, perform follow up investigation as needed and prepare a written report. If requested, we can give guidance on the best way to remedy the situation. When lyctids or bostrichids are identified, the solution is usually less severe. Once emerged indoors, these beetles have a difficult time re-infesting wood. They are not likely to crawl through a floor finish as both starch and moisture within the wood has usually declined. The solution is usually simpler when only a few pieces of flooring are infested. The infested and adjacent boards can often be removed, replaced and the finish matched. Sometimes it is preferable to sand and refinish the entire hardwood floor. Once the old finish is removed and before the new finish applied, it can be treated with a borate spray. Borates will penetrate unfinished wood though they will not penetrate through polyurethane or other water repellent coatings. Treating with borates can be expensive and usually not required. Lyctids and bostrichids are not likely to re-infest, especially, when the moisture is properly controlled. Borate applications into dry wood is minimal and will have little effect of developing larvae. Structural fumigation will usually only be warranted when infestations have spread into the structural components of the building. Powderpost beetle infestations that have been active may die out on their own. You can often make this determination by first vacuuming up any powdery substance, sealing off the holes with a piece of tape and monitor for new holes or powder. Powderpost beetles are attracted to light and mostly seen during spring and summer months. To keep wood flooring beetles under control, keep moisture under control. Make sure that the soil in the crawlspace has a 100% covering of a suitable moisture retarder and good cross ventilation. Control the temperature and relative humidity to the requirements of the flooring manufacturer or the National Wood Flooring Association – NWFA. 30-50% and 60-80 degrees Fahrenheit. Keeping the environment in this range will result in an equilibrium moisture content of 6-9%. The Weinheimer Group, Inc serves the states of Oregon and Washington. Request and Inspection or contact for more information. A floor covering inspector is an individual or company that inspects flooring products and installation to determine if the product or its installation have failed or it is performing normally. You may need this service and have just learned that they are available. You spent a lot of money only to see your floor covering investment failing. The manufacturer of your flooring may have had the product inspected. 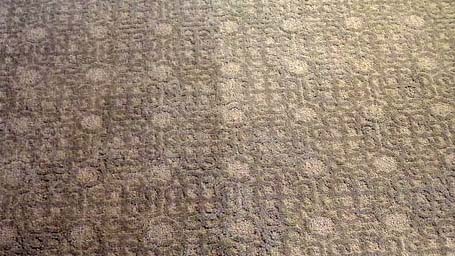 Unfortunately, not every floor covering inspector has the experience to properly diagnose your flooring problems. Many flooring inspectors are excellent and some are no more than a hired gun for the company that hired them. With over 50 years of combined inspection experience we regularly view reports from inspectors and have seen it all.